Two co-workers and I traveled to Brazil on a project assignment in late 2017. 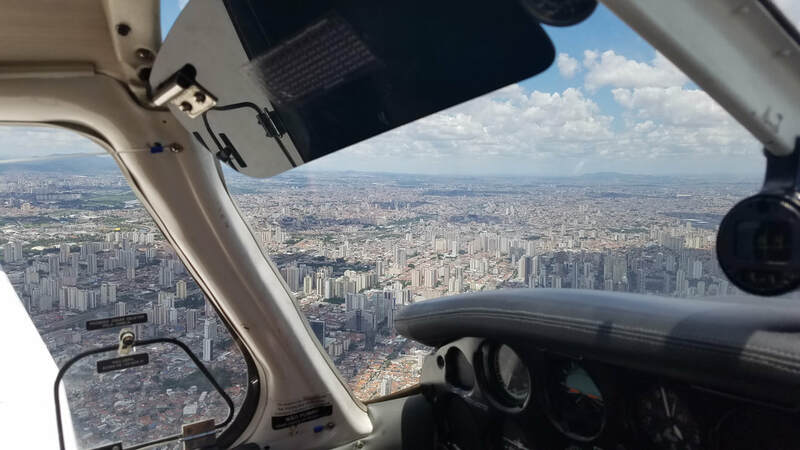 When I realized we had a free day in Sao Paulo to explore between work visits and heading back to the States, I quickly looked at places where I could go flying from. The Aeroclube de Sao Paulo, at the Campo de Marte airport, only seven kilometers from downtown Sao Paulo, not only welcomed my ability to go on a flight around the area with an English speaking instructor but they are also one of the oldest flight schools still in operation in Brazil, established in 1931. Pretty cool! Brazil seemed to be like Europe as far as departure times and protocols. 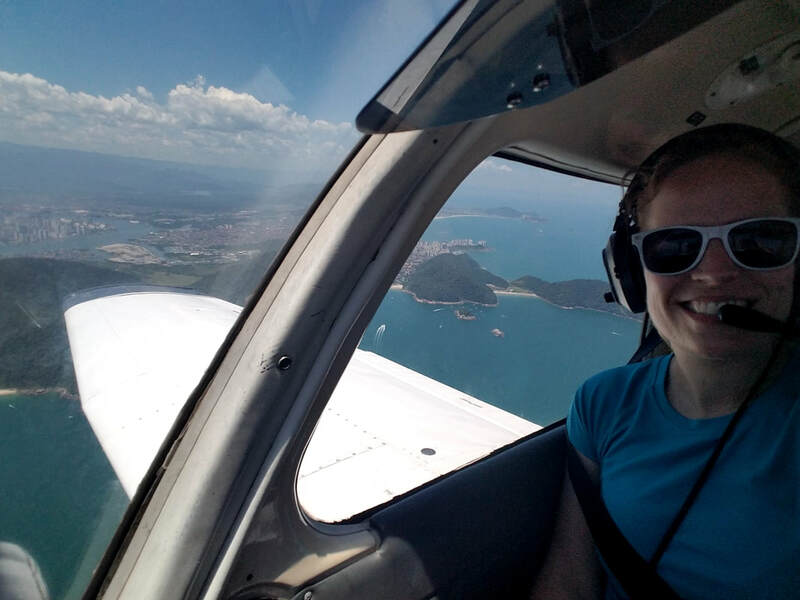 My co-worker Jack and I arrived at the Airport early and both the airplane and our instructor Cassiano were available; however, we had to wait to depart until the pre-selected departure time for flight planning purposes. It was ok; that allowed us time to observe operations at Campo de Marte (SBMT). It is a fairly busy general aviation airport with lots of mixed traffic, including a good number of helicopters even on a Sunday. The community is apparently pressuring its closure since it is in the middle of town but it seemed to be a very important transportation link and economic generator to us. Where would all those GA aircraft go? Guarulhos or Congonhas Airports? Doubt it! I rented what looked to me like a Piper Archer II/Cherokee 180. They kept calling it a Tupi. I thought it was their cute nickname for it. But, was it? As soon as I sat inside, I noticed the Embraer logo on the yoke. I joked with the instructor that it was a funny touch given that Embraer is a Brazilian company. He educated me that the aircraft was, in fact, built by Embraer. 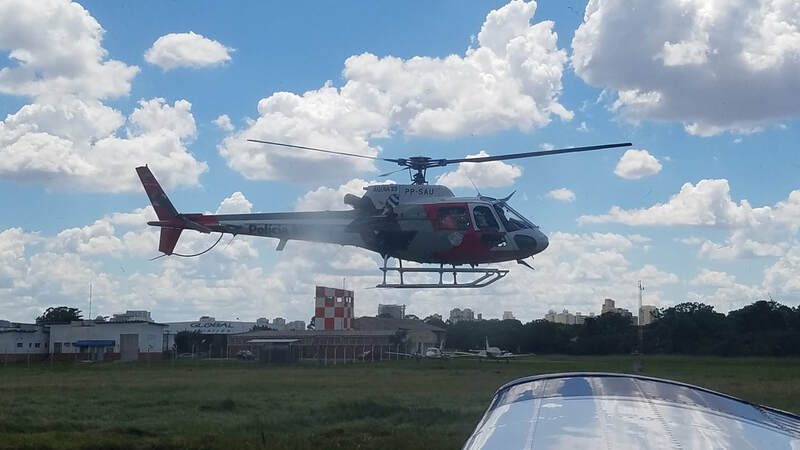 Piper PA-28s were built under license in Brazil as the Embraer EMB-711A and EMB-711C Corisco (PA-28R-200), EMB-711B (PA-28R-201), EMB-711T (PA-28RT-201), EMB-711ST Corisco Turbo (PA-28RT-201T), and the EMB-712 Tupi (PA-28-181), like ours, for a few years. Neat! 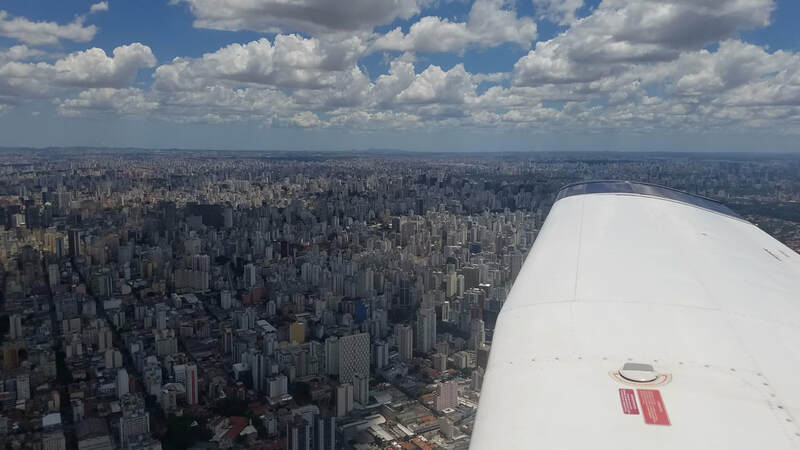 A pilot is always learning and another interesting logbook entry was in the works… So, Embraer PT-NTY took us on a nice cross-country. The area’s sectional chart was not too detailed (no terminal chart, either) as its scale appeared to be a bit small but you can see it below. 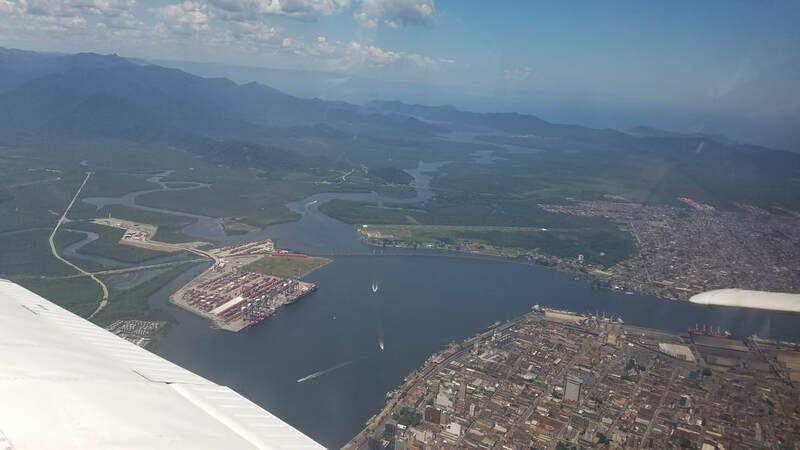 The route planned took us from SBMT to Palmeiras via a VFR corridor with a 130 heading between 4,100 and 5,000 feet, then south to Santos over Rio Grande da Serra. 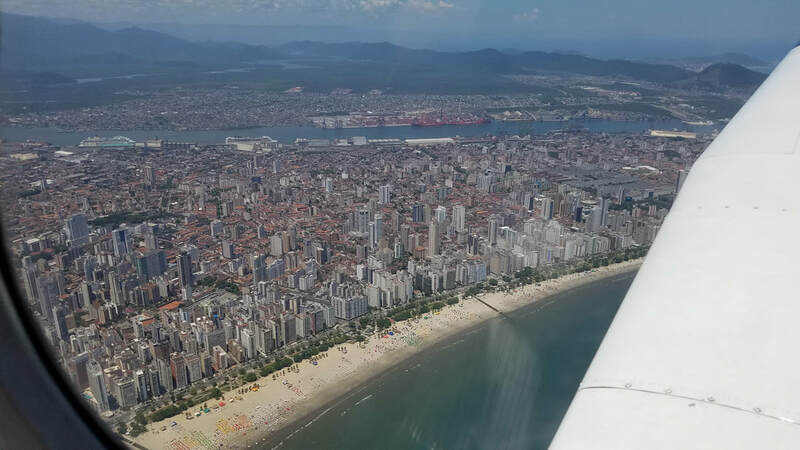 After a loop around Santos, the return flight was back to Palmeiras, then Represa Suzano to take the same VFR corridor in the opposite direction (heading of 309 between 3,700 and 4,000 feet). After Cassiano completed the aeroclub’s flight plan sheet, we were off to the ramp. After pre-flight, it was engine start and taxi. Campo de Marte is definitely an older airport with its pavement in fairly poor condition and the rest of its infrastructure in need of some up keep (unlike the rest of the airports we saw while in the country). The Tupi gave us a great run-up so we took Runway 30 at B for departure. 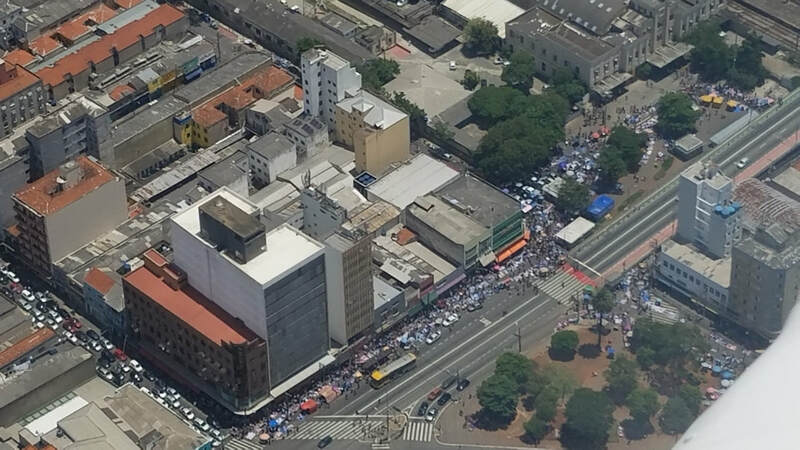 Sao Paulo’s crowded streets and large number of skyscrapers was shocking. 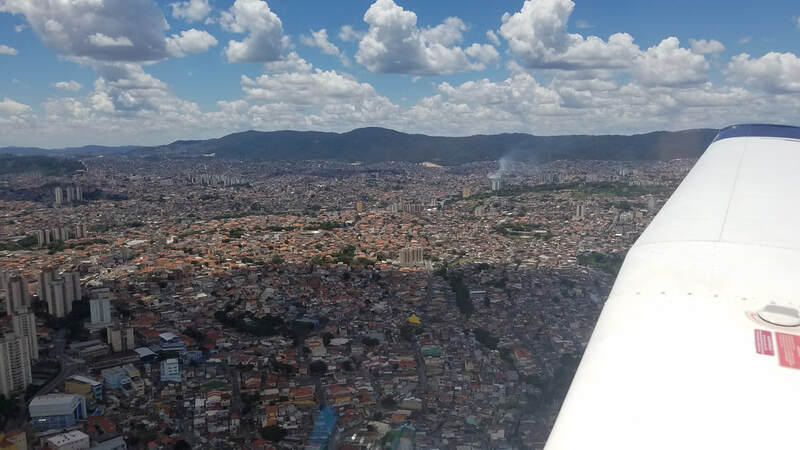 I expected to see areas with favelas (Brazilian Portuguese term for slum, favelas are very low-income homes in Brazil) but I did not realize the rest of the City would be so incredibly crowded as well. We couldn’t even see pavement, just roofs, at times. 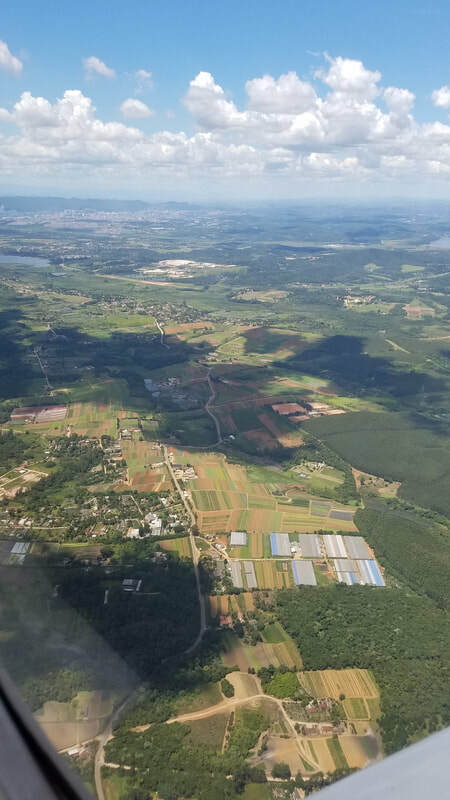 And we only saw a few green spaces and, again, absolutely no potential places to land other than the airports (which were also pretty constrained and land locked). Where we could see pavement, it was often occupied by vehicles. Even on a Sunday, traffic was fairly heavy in Sao Paulo. Everywhere we looked... buildings and more buildings! 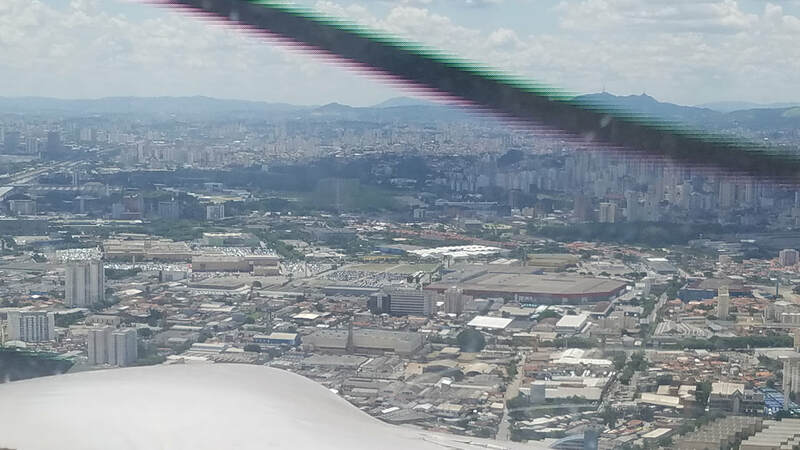 We were unsure what was going on down below us but, just a few minutes later, we were leaving Sao Paulo behind for the nice countryside and nearby Santos. While the distance between the two cities is only 74 kilometers (46 miles), it can easily take upwards of two hours to travel by car between the two due to traffic. 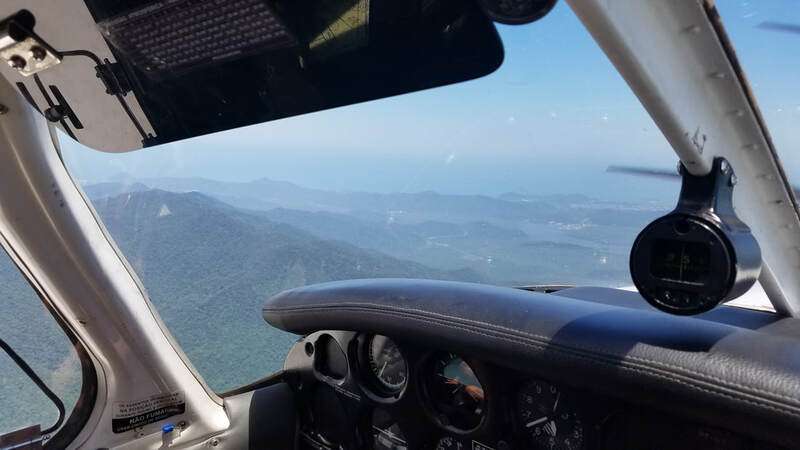 We overflew a nice and virgin mountain range with a few waterfalls and the instructor shared that a few dangerous animal species live in them. They reminded me of the Smoky Mountains or LA’s mountains ranges since they were not too abrupt, were wooded, and had haze all inside them. Santos is a coastal city with a major seaport for both passenger/cruise ships and cargo ships. It also has a military airfield that civilians do not have access to even though it is not often used. I neglected to explain that, at my request, Cassiano did all communications with ATC in English so I could understand; however, he asked that he talk with the military controllers at this field in Portuguese because they probably would not understand English and it could be a bit chaotic. Sure, no problem. It’s just too bad that they don’t let civilians use the Airport because it sure is in a good location, close to nice beaches. 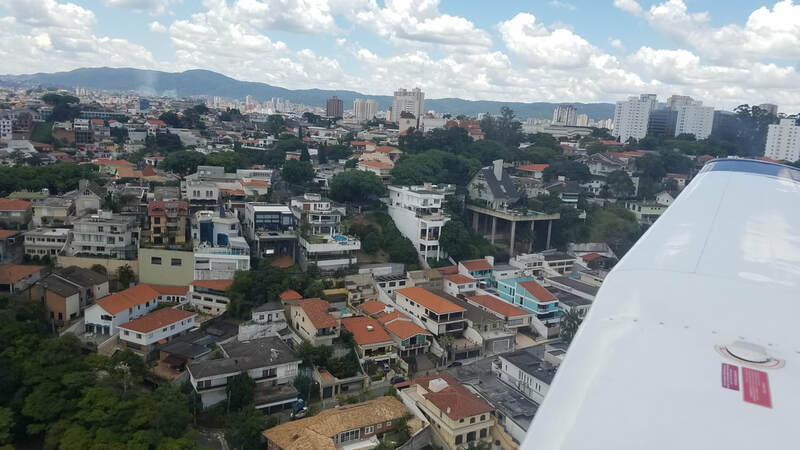 The developed areas looked very much like Sao Paulo. Skyscrapers, favelas… all on top of each other. But ohhhh those nice beaches and beautiful water sure beat Texas beaches (sorry, Texas!). I happen to especially enjoy some terrain/elevation with the water as well so those nice little islands and hills by the coast were pretty enjoyable to see. I felt bad for those having to live in the homes shown above. 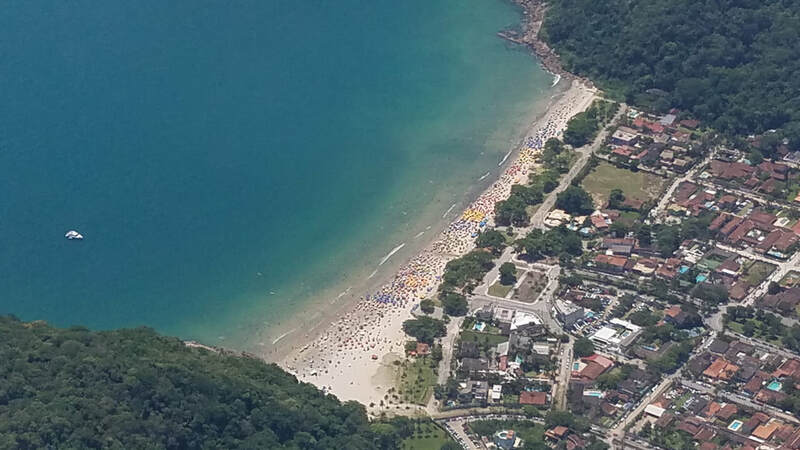 Since the weather was gorgeous, a lot of people were out enjoying the day, including swimmers and sun bathers on the beach and a descent number of recreational boats (sail boats and motorized). Much like the military airport does not allow civilian access, we also saw a couple of islands and coves that are military owned where civilians cannot be near, such as the one below. Once back in the corridor, rather than heading towards Itaquera (on the sectional), we went slightly left towards the Corinthians soccer stadium (the best soccer team according to our biased local), built in 2014 for the 2014 FIFA World Cup. It hosted six matches, including the opening match on 12 June 2014. You can tell by the picture below that it was an easy VFR checkpoint. From there, we flew straight back to SBMT. Like my husband and I have seen in Australia and other countries, SBMT had a visual approach chart (below). From our direction, it set us up directly on final for Runway 30. 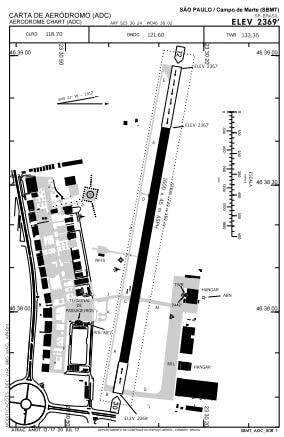 Do you have the Airport insight? 12 o’clock, 1 mile. 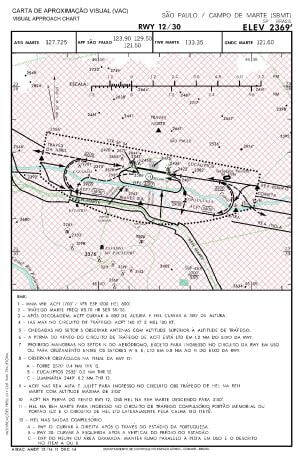 It was also interesting to see that the visual approach chart calls for “circular patterns” versus the “box or rectangular” patterns we’re used to here in the U.S. You may remember that the University of North Dakota (UND), in partnership with the AOPA Air Safety Institute, was supposed to be studying this option in late 2016 to see if it helps stabilize approaches but I have not seen those study results yet. This police A-Star helicopter sure didn’t mind getting close to us on taxi. Who’s getting a ticket now? The aeroclub had a logbook for each aircraft. Very much like a pilot logbook, the airplane’s logbook included the information we always see in shared aircraft (name of PIC and/or CFI, date, local and hobbs times, etc) but it also included origin and destination, more detailed time information, VFR or IFR and day or night options, and souls onboard. What’s interesting is there was no engine oil, squawks, or fuel quantity information which seems more important to me, for example, than all those other things. A wonderful 1.1 hour flight experience (always the highlight of any trip) and $243.25 later (in line with other countries we’ve flown in), we were off to lunch. The Airport has a restaurant next to the aeroclub with fantastic views of the airfield. Jack and I had a hearty Brazilian lunch and a caipirinha (Brazil’s national cocktail made with cachaça) with the windows open while we watched different kinds of airplanes and helicopters come and go. By the way… ask anybody in Brazil who invented the airplane and there is a good chance their answer will be Alberto Santos-Dumont. According to a CNN article (http://www.cnn.com/2003/TECH/ptech/12/10/brazil.santosdumont.reut/), he was an idealist who believed flight was spiritually soothing (what pilot doesn’t!?) and flew a kite-like contraption with boxy wings called the 14-Bis about 722 feet on the outskirts of Paris on November 12, 1906. It being the first public flight in the world, he was hailed as the inventor of the airplane all over Europe. It was only later that the Orville and Wilbur Wright proved they had beaten Santos-Dumont at Kitty Hawk, North Carolina, three years earlier on December 17. Jack and I came across a replica of the 14-Bis on a roundabout close to the aeroclub (it is actually shown in the airport diagram). My picture of it, below, is not very good as we were not expecting to see it from the Uber.